Anxiety disorders affect more than 25 million Americans on average. Anxiety is a psychological state that is characterized by the intensified and incessant feeling of worry, tension, and nervousness, often when there is nothing to provoke these feelings. Forms of anxiety disorders include generalized anxiety disorder, panic disorder, social phobia, post-traumatic stress disorder, and obsessive compulsive disorder. Anxiety is twice more likely to affect women than men. 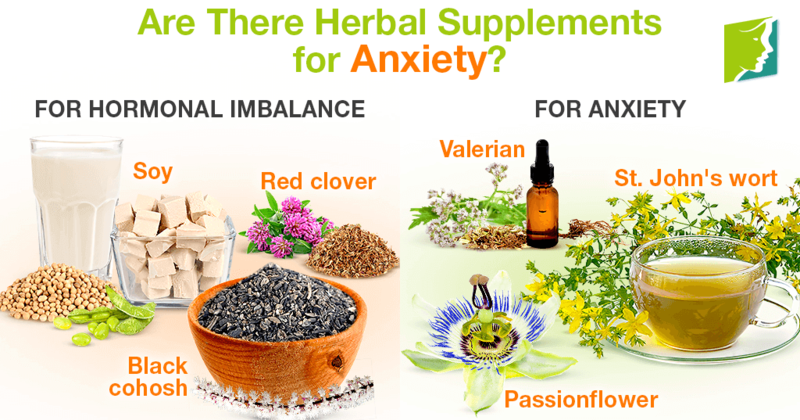 There are several herbal supplements for anxiety that can help ease the symptoms by naturally calming the nerves. The leading cause of anxiety disorders in middle-aged women is hormone fluctuations experienced during menopause. A woman's estrogen levels fluctuate, drop, and stay consistently low during the menopause transition. Estrogen considerably affects the brain's regulation of moods and emotions. Subsequently, when a woman's estrogen levels fall, she is at higher risk of mental health disorders. Additional causes of anxiety include excessive stress - either at work, home, or financially - genetics, certain medications, previous emotional trauma, lack of exercise, and poor diet. There are two types of herbal remedies that can help with anxiety due to hormonal imbalance: phytoestrogenic herbal remedies and hormone-regulating herbal remedies. Phytoestrogenic herbs contain estrogenic components produced by plants. These herbs treat hormonal imbalance by introducing the plant-based estrogens into the body. Soy. Soy has been a commonly used herb among menopausal women because it is known to help symptoms like anxiety and hot flashes. This is thanks to its isoflavones, a type of phytoestrogen. Black cohosh. Black cohosh also contains phytoestrogens, which helps restore low levels and relieve symptoms. Red clover. Red clover also has a high phytoestrogen content. Red clover helps bring estrogen levels back to normal. Hormone regulating, or phytoestrogenic herbs, do not contain any estrogen. These herbs stimulate hormone production by nourishing the endocrine glands. This leads to more efficient production of natural hormones. For instance, Macafem helps stimulate your endocrine system, leading to optimized hormone production. In addition to the beneficial herbal remedies for restoring hormone balance, there are several herbal remedies that can specifically help reduce anxiety by naturally calming the body and mind. St. John's wort. This herbal remedy has been used for thousands of years for nerve disorders like anxiety and depression because it is said to help prolong the action of the “feel-good” neurotransmitter, serotonin. Passionflower. This herb has been widely used to treat anxiety and sleep disorders. Passionflower has sedative and anti-inflammatory properties, making it an ideal calming herbal remedy. Valerian. This sedative herb has been popular among menopausal women to help naturally relax the body and brain and achieve a natural sleep. Anxiety is a common symptom among menopausal women because of the hormone imbalance experienced during the menopause transition. Several herbal remedies that can help ease anxiety by restoring hormone balance are black cohosh and Macafem. Passionflower and valerian are sedative herbs that can help naturally relax the body and mind, easing anxiety symptoms. Helpful lifestyle changes that can help with anxiety include exercising regularly and maintaining a healthy diet.